Weekend to forget as there's a gremlin in the car. 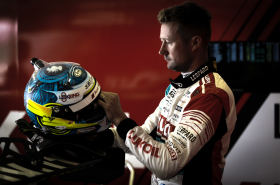 Gordon Shedden suffered a tough weekend at the Slovakiaring, as he and the Audi Sport Leopard Lukoil Team struggled to resolve a technical problem with their Audi RS 3 LMS during the weekend. Although the Audi was showing improved pace on the whole in Slovakia, a track which going in was known to favour the saloon-shape RS 3, Shedden's car didn't feel right from the get-go. With a typically tight timetable, there was little opportunity to get to the bottom of the issue, with the races the only real test, but even then they didn't go to plan, with Shedden's Audi twice the victim in incidents involving dubious driving standards. The car was damaged after Race 2 with contact from the Cupra TCR of Zsolt Szabo, for which the Hungarian was given a penalty, while Sunday's final race was a write-off on lap one when Shedden was taken out by the Volkswagen of Mehdi Bennani. The team have tasked themselves to find the problem and resolve it within the next month, before all the cars are shipped for the flyaway rounds in Asia at the beginning of next month, with a two month break before the next round in China. "It's been a frustrating weekend, as the car's just not handling properly, and we don't know why, and that's put us in the wrong part in the field and we just keep getting caught up in silly accidents by drivers who we shouldn't be near. "We just don't can't get the same lap times out of it as everyone else; there are also odd sounds coming from the car under braking. We desperately need to sort it before the cars go off to China, as if we have the same problem when we're out there, the rest of the season is a almost a write-off. "We know the Audi should've been quick around Slovakia, and they all were but my car, and none of the other drivers have been here before so we know that's not a factor. "I know the team are working hard on the problem, and hopefully we can find some time to back-to-back test the cars somewhere before the race cars go on the boat to China in August so we can confirm the problem and come up with a plan, even if that means changing cars." The next round of the 2018 FIA World Touring Car Cup takes place at the Ningbo International Speedpark in China on September 29th-30th. Race report and images provided by Gordon Shedden Racing.